A collection of Japanese film reviews. Director Akiyoshi Koba is a part-time lecturer at Nagaoka Zokei University and an indie filmmaker whose works feature a mixture of everyday settings dusted with a little sci-fi and tweaked with comedy. Titles include, Slippers and a Midsummer Moon (2015) where two sisters travel between parallel worlds to find their missing father, the tokusatsu parody short Psychics Z (2016), and Tsumugi’s Radio (2017), a gentle comedy about mental illness and mistimed romance told with a lot of flashbacks. In each of the films, mundane locations are used for out of the ordinary events. This is probably driven by budget constraints but it has resulted in an oeuvre which celebrates the possibility of fun and DIY filmmaking in small-town Japan. Nunchaku and Soul is probably Koba’s most amusing work to date and continues in this vein. Koji Fukada’s Harmonium took the Jury Prize at the 2016 Cannes Film Festival and for good reason because it shows a director in precise control of his material. Story-wise, it follows in the footsteps of his debut feature Hospitalite (2011) wherein a stranger enters the lives of a family and disrupts things. While Fukada’s earlier title was light-hearted and poked fun at the social mores of Japan, this film is harsher with only a few dashes of hope beaming down in the final scenes. Taking the lead is experienced thesp Kanji Futurachi, a familiar face from Fukada’s earlier films like Au Revoir l’ete (2015) and Human Comedy Tokyo (2012) and, crucially, Hospitalite (2011) where he was the stranger that forced a revolution on a family. In a role reversal he is the patriarch and a victim of sorts here as he plays Toshio, the owner of a small factory in the suburbs of some city or other. No location is given. It’s a nondescript and quiet place where he lives a quiet existence with his church-going wife Akie (Mariko Tsutsui) and their daughter Hotaru (Momone Shinokawa). It is she who plays the titular harmonium that gives the film’s soundtrack a funereal sense. Koji Fukada is a film-maker inspired by the cultures of France and Indonesia as best evidenced by him transplanting elements to his native Japan in his many works. His like of French New Wave cinema is made obvious by this film, Au Revoir l’ete, which means goodbye summer and plays like an Eric Rohmer film where relationships are unpicked in a nonchalant manner as we get to a deeper understanding of some human relationships. It’s the perfect title for a film that describes the quiet misadventures of a teenage girl who waves goodbye to her naivete and matures a little more while in the company of some childish adults. It is late August and an eighteen-year-old Tokyoite Sakuko (Fumi Nikaido) is a ronin student who is preparing to take her university entrance exam after flunking her previous one. Studying is the perfect excuse for her to tag along with her aunt Mikie (Mayu Tsuruta) who is house-sitting for her sister, Sakuko’s mother, in a sleepy coastal town. 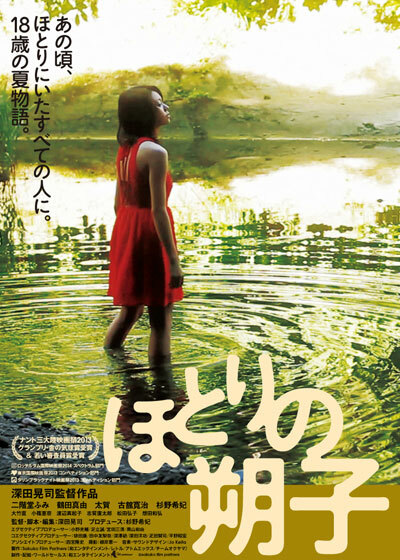 Koji Fukada’s (Hospitalité, Au revoir l’été) 2015 movie Sayonara is billed as the first ever film with an android as one of the stars. As intriguing as seeing an artificial life-form act seems to be, the final result is a pretty lifeless affair in both acting and story terms but it does have some emotional impact. It is based on a collaboration between Japanese playwright Oriza Hirata (a familiar collaborator with Fukada) and a leading robotics scientist named Hiroshi Ishiguro who works at Osaka University and has been developing different models of the Geminoid androids since 2005. Their team-up resulted in a 15-minute stage-play that travelled Japan with people being able to see the actor Bryerly Long conversing with the latest in android technology. With the two actors on stage and sat down it was a largely static affair in a story where a human woman comes to terms with her impending death through talking and the recitation of poetry. The film largely adopts the stage-play from what I have read and, despite looking good, suffers from relaying the content straight in an end-of-the-world tale that takes two hours but feels longer. Japan is a society where manners and decorum are everything. This is good for the most part. Politeness is the oil that makes society run smoothly. It does have its problems because it can be a nice veneer used to cover up nefarious behaviour or act as a battering ram forcing people to act certain ways. In such an environment, all sorts of negative emotions like paranoia and mistrust can run rife under the surface of individuals and social groups. Hospitalite makes this environment its playground and takes things to absurd heights as it critiques how Japanese society can use outsiders as a scapegoat for problems inside the community.